In the late '60s, Jean Luc-Godard was at his most politically strident. Discontent with representational cinema, he was moving away from his pop-culture retreads into something more confrontational and less reliant on narrative. From his feature film Weekend to his short segments in anthology films like Far From Vietnam and Love and Anger, and even in his Rolling Stones documentary, Sympathy for the Devil (a.k.a. One Plus One), with its perplexingly didactic skits, he was breaking down the notion of cinema frame by frame. By 1969, he was ready to issue a new manifesto, and he did so in the film Le Gai Savoir. Explaining Le Gai Savoir is a daunting task, almost as daunting as watching it. With the 16th-century philosopher Jean-Jacques Rousseau credited as co-writer, Godard had come a long way from Bogart-obsessed gangsters. Though his movies always toyed with sound and image, and he laced even the most familiar genre subjects with political undertones, don't expect the same kind of experience here. Le Gai Savoir is practically his line in the sand, setting the stage for his collaborations with Jean-Pierre Gorin and even his more recent films, including 2004's Notre musique. Forget plot summary. The closest we have to a plot here is that two activists, the student-representative Emile Rousseau and the voice of the working class Patricia Lumumba--who also go by their real names, Jean-Pierre Leaud and Juliet Berto, in the movie, and who both were in Godard's La Chinoise and Weekend--are meeting in a Beckett-esque void to discuss a maelstrom of ideas including the current world climate, the purpose of cinema, and even personal philosophies. Their dialectic is illustrated by a collage of words and images, including news photographs, cartoons, advertising, and propaganda posters, an ever-flowing montage bringing to life Godard's theories about the marriage of image and sound. That's as near as I can confidently get to the main goal of Le Gai Savoir: finding where image and sound intersect and asking how that informs how we know what we think we know. 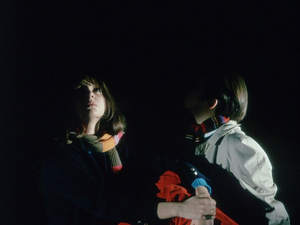 For Godard, it is a central question that pertains to what we, as people, do in order to advance this world. We can't, for instance, engage with corrupt leaders or change the way the system is run if we don't understand how they use these things to transmit their agenda. How else can we break the inundation of false information and bend it toward the truth? Eventually, the argument even turns back on itself and Godard is forced to question the role cinema plays in this dialogue. This is where the manifesto element of the movie comes into play, the director issuing a challenge to the world directors, from Italy to Cuba, to create material that challenges and provokes. Always one to wear his influences on his sleeve, Godard throws the names of Bertold Brecht and Antonin Artaud in with Mao, Guevara, and Castro. Certainly the long, loud electronic pulses that periodically blared from my speakers fly the flag of Artaud's theatre of pain. Godard himself speaks as a professorial narrator, instructing his actors through the robotic voice box that he used in other films like Alphaville and Oh, Woe Is Me! He also cuts up documentary audio of real speeches and protests to show us how information can be manipulated. The auteur even self-effacingly accepts that compromise can touch his own work, fabricating censorship with missing audio and excised scenes that never really existed. Le Gai Savoir challenges its viewer to stay alert. I can't say I digested the entire thing, as it moves with a furious pace, in some instances the rapidly changing images and the words both written and spoken acting more as a subconscious provocation than easily grasped nuggets of wisdom. I would guess this is part of Godard's intent, to shock us from what is comfortable, to force us to engage with what is happening on the screen. I am not sure I enjoyed it so much as I appreciated it, and I know many people will find it to be pretentious drivel. Still, I'm fascinated by it, and though I don't particularly want to sit down and watch Le Gai Savoir again right now, I do want to revisit it eventually and try to chip away at its dense layers. Unfortunately, I don't believe Koch Lorber, who are releasing Le Gai Savoir on DVD in Region 1, has done its U.S. audience any favors toward making it easier for us to consume the movie. 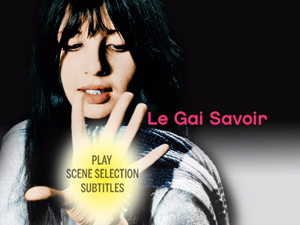 Le Gai Savoir has the original French soundtrack with removable English subtitles, and though the audio is consistently translated, the words that appear on the screen are not. Almost every still image Godard chooses to show in his long montages either come with words already built-in or he has written his message on top of the picture. The DVD producers have only translated the phrases that appear when they conveniently fall between spoken lines--and even then, not necessarily. The title Le Gai Savoir appears on the screen multiple times, and I don't recall it being translated even once. The phrase "The Joy of Learning" has some bearing on the meaning of the movie, and it should be drummed into our brains. Plus, given that one of the movie's slogans is that spoken language is our enemy, it seems counterintuitive to give it heavier weight than the other uses of language in the picture. Not that I could likely have kept up with all of that additional stimuli, but that's not really the point, is it? A layer cake without a layer is less of a cake, and by Godard's way of thinking, our comfort with the way things have been is what allows us to end up with where things currently are. With the crises of Vietnam and the clashes of communism and capitalism that so occupied many intellectuals in the 1960s, Godard was trying to make something immediate that spoke of the dangers of complacency and the need for revolutionary fervor. You almost need a scorecard to keep up with the political players he references (and, hey, that would have made a nice DVD extra), but he never expected to solve the problems, just incite his viewers to want to know more. 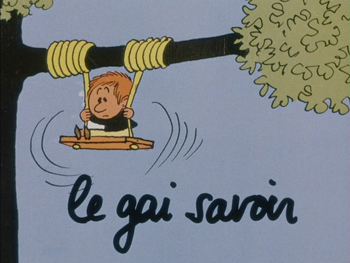 Le Gai Savoir is shown here in its original aspect ratio of 1.33:1. The full frame image is of okay quality, with most of the colors looking fairly good. 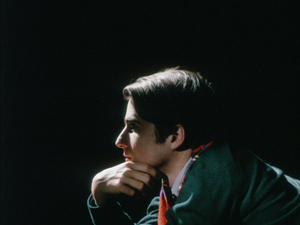 Whenever Leaud and Berto are on screen, however, they appear against an entirely black background, and every time they show up or the screen itself goes to black on purpose (sometimes for quite some length), the black is dotted with lots of white specks that suggest the transfer is not as conscientious as it could be. I also detected some minor instances of ghosting around the central figures. The original French soundtrack is available in a straightforward Dolby Digital mix. This is mainly dialogue with occasional music, so it is serviceable and doesn't necessarily need to be any fancier. As noted in the main review, there are English subtitles on the disc--yellow and removable--that are good, if sometimes fast, and sometimes incomplete. There are no advertised extras on this DVD, but the trailer for Godard's film La Chinoise plays before the main menu loads. Koch Lorber is releasing that film on the same day as Le Gai Savoir. Critics always fall back on the easy justification of "it's probably not for everybody" when trying to reconcile a difficult piece of cinema, but I'd say that warning has never been truer than for Jean-Luc Godard's 1969 political tract Le Gai Savoir. The irascible auteur chooses deconstruction over narrative and agitprop over parable, leading to a thought provoking and disconcerting rummaging through how a moviegoer interacts with the movies he or she goes to. Working only with two actors, Jean-Pierre Leaud and Juliet Berto, and illustrating their discussions with a barrage of still images, abstracted audio, and sloganeering, he's not telling a story here, but attempting to get back to the primal urge of communication itself. Some will find it insufferable, and even those of us who regularly enjoy Godard may find ourselves enjoying the effect more than we enjoy the experience. Given the demanding nature of Le Gai Savoir, then, as well as the questionable quality control of Koch Lorber, I'm going to recommend folks Rent It unless they are the most dogmatic of Godard completists. I'm glad I own it, but I don't want you coming after me if it cleaves your brain in two.